Despite the large burden of disease for both breast and prostate cancer, breast cancer receives substantially more federal funding and little is known about the extent to which advocacy in social media differs between them. We aimed to perform a comprehensive comparison of Twitter activity related to prostate and breast cancer over the past 5 years (1/11-1/16) using the Symplur Signals analytics platform. 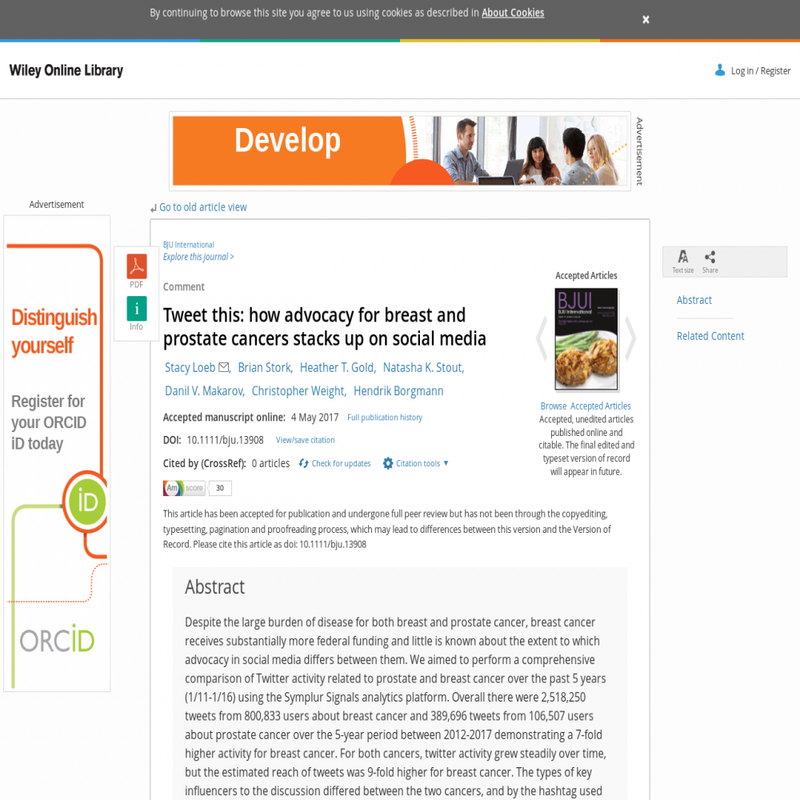 Overall there were 2,518,250 tweets from 800,833 users about breast cancer and 389,696 tweets from 106,507 users about prostate cancer over the 5-year period between 2012-2017 demonstrating a 7-fold higher activity for breast cancer. For both cancers, twitter activity grew steadily over time, but the estimated reach of tweets was 9-fold higher for breast cancer. The types of key influencers to the discussion differed between the two cancers, and by the hashtag used (#breastcancer or #bcsm, and #prostatecancer or #pcsm). The mean number of tweets during October breast cancer awareness month (166,896 tweets/month) was 16 times higher than the combined total of prostate cancer tweets during awareness months of September and November ("Movember") (10,159 tweets/month). Considering the potential utility of social media to increase cancer-related knowledge, public awareness and education, our findings suggest a role for greater advocacy on Twitter by the prostate cancer community. This article is protected by copyright. All rights reserved.